This year’s New York Fashion Week is September 8 through September 15, and the city is already buzzing in preparation. While you’re packing your suitcase with the latest patterns and trends, it’s time to make sure your lodging plans are also in order. At Corporate Habitat, you’ll find the perfect short-term apartment to complement the extravagant week ahead of you. Be Close to the Action: Don’t miss out on any of the NYFW events just because your lodging is too far away. Corporate Habitat’s luxury apartments are conveniently located on the Upper East Side, the Upper West Side, Murray Hill, and the Financial District. Although travel times depend on the neighborhood you choose and the events you attend, the NYFW venue will be only a short subway ride or a quick walk at most. Take the Luxury With You: Once you’re done viewing the beautiful gowns and stunning menswear, why not take that opulence home with you? Corporate Habitat’s luxury apartments are packed with amenities to make your stay as comfortable as possible. Your short-term rental will have a large, updated kitchen as well as a gym and internet access. These fully furnished apartments have a cozy yet modern flair, perfect after a long day by the runway. Save on Lodging: The average hotel room in NYC costs $300 a night, which starts to add up, especially if you’re staying for the entirety of NYFW. A short-term apartment, on the other hand, is a more affordable option for longer stays. Each rental lasts for 30 days, so why not explore Manhattan after the festivities have ended? With all the money you’ll save, you’ll have extra room in your budget for not only NYFW tickets but also for food, museum admission, and other activities around the city. Luxury isn’t just for the runway; it’s also a lifestyle. 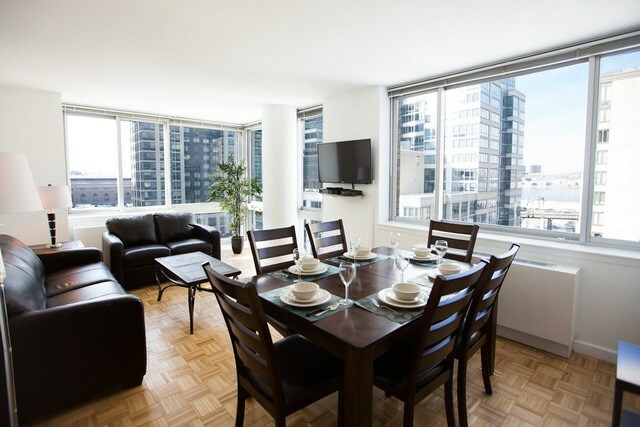 To book your own luxurious short-term apartment during New York Fashion Week, call Corporate Habitat at (212) 242-4108. To see the apartments that they currently have available, check out their online listings today.